Alchimia Films Inc. has been our film company since we began directing and shooting TV commercials in 1991. When the business moved away from film, I focused back on my photography. And just when everyone thought they were a photographer, I started back with my drawing and painting. Always swim against the current. My first project is for our friend Marianne McKenna, OC of KPMB Architects for her renovation and restoration of the Royal Conservatory in Toronto, Canada. Included in this renovation was the creation of the magnificent Keorner Hall. 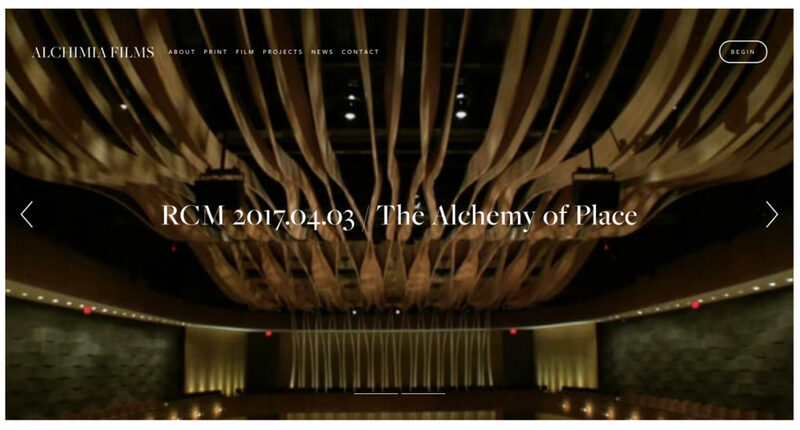 The title of this short film is “The Alchemy of Place”. It was shot entirely on an iPhone 6, with sound recording on an iPhone 4, edited in iMovie creating titles made in inDesign, with existing photos of the project manipulated in Photoshop all brought together working with only 1-2 assistants. What I love about working on a project like this, is that it intersects my love of art, art history, architecture, photography, film and a lifetime of learning and looking. This was a great project made fun through the learning as Marianne and I explored the process of telling the best story of her Conservatory. I think we will use what we have learned on other projects in the future. I welcome any inquiry to work on any project in this style.